The pair have been draw together for the first two rounds of the $5m Lake Malaren Shanghai Masters just a week after McIlroy’s shock decision to leave Chubby Chandler’s management stable and join McDowell at Dublin-based Horizon Sports. Chandler, Westwood and Darren Clarke as all still following McIlroy on the social networking site. But McIlroy’s abrupt severing of Twitter ties with the ISM boss and the former world No 1 is intriguing. Amicable or not, McDowell certainly isn’t about to offer any theories on why McIlroy walked away from ISM. “What’s for me to say what went wrong with Rory’s situation. I’ve no idea,” McDowell said in Spain on Wednesday. If there were rumblings that McIlroy was planning a move, McDowell wasn’t aware. On hearing the McIlroy and Westwood had been drawn together in what amounts to a 30-man exhibition that offers $5m in prize money but no official status or world ranking points, McDowell was amused. “It’s great, very ironic,” McDowell added with a grin. “They’ve played plenty of golf together and I know they are both very competitive. They’ll want to be out there and beat each other up – obviously from the golf point of view (grins again). “It’s an unusual one but things change. Listen I went through the same process three or four years ago and it was very amicable. I’ve read in the media what Chubby has said about Rory’s split and it all seems pretty amicable as well. That’s life, it’s business, not personal. That still doesn’t explain McIlroy’s unfollowing of Westwood and Chandler on Twitter. Didn’t McDowell think there was much of an edge to the tweets they were exchanging? “Yeah, I always figured they were jokes with jabs,” he conceded. As for Westwood’s “bizarre decision” tweet, McDowell said: “That’s Lee Westwood’s opinion. He knows nothing about what Conor’s team does and the kind of experience Conor has. I’ve put my 100 per cent trust in them to do a great job for me and I feel it’s just an opinion. If the rivarly between McIlroy and Westwood led to a “this stable ain’t big enough for the two of us” situation, what lies in store for the Holywood kid and his pal from Portrush. After all, McDowell left ISM to get more hands on attention. Is there room for two big stars at a boutique company that also features the likes of Ross Fisher, Shane Lowry and Michael Hoey? 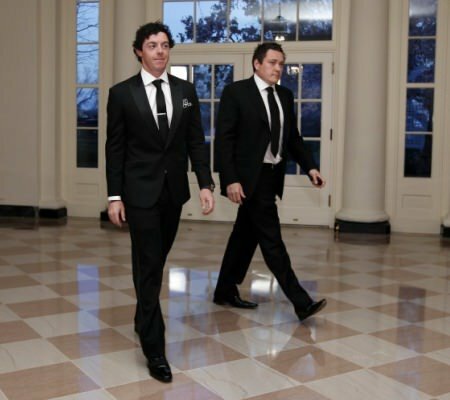 Rory McIlroy is unlikely to have shed a tear in sympathy for Conor Ridge and Horizon Sports Management following the announcement by Graeme McDowell on Sunday night that he's leaving the boutique Irish agency to manage his own affairs.